Steven Weinberg earned a BFA degree from the New York State College of Ceramics at Alfred University and then went on to study with Eric Hilton, a designer at Steuben Glass. A Master of Fine Arts degree was subsequently earned by Steven at the Rhode Island School of Design. Layered glass, cut and polished and often with embedded cast images is the creative direction taken by Weinberg. His works evoke fantasies and symbols of personal narrative and expression. 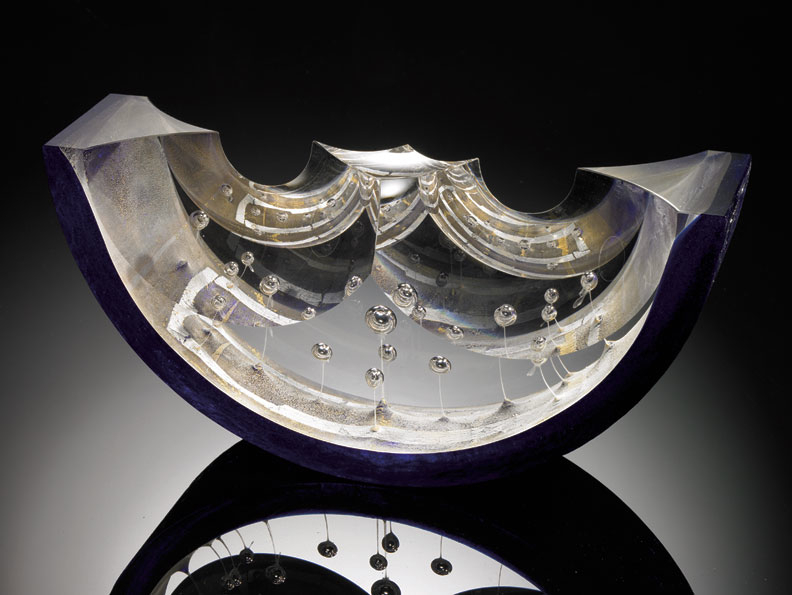 Weinberg’s glass is brilliantly clear crystal that contrasts with sandblasted images within. His glass is clearly sculptural, but while its exterior seems liquid, by contrast, the sculptured interior forms are molds representing an illusion of forms that were once three-dimensional.